Airbags have saved thousands of lives after having been massively installed on all vehicles. The idea of the airbag system is simple: airbags are puffed up quickly enough to protect the human body in the event of an accident. It’s very useful to know how airbags system works in the car. You may ask: “What is air bag system in car?”. During the car accident, the “brains” of an air bag initiate the arson of a solid fuel charge, which burns at a tremendous rate and quickly (30 milliseconds) creates the required amount of gas to fill the whole airbag. The cushion of the airbag literally explodes, leaving its seat at a speed of up to 322 km/h, faster than a blink of a human eye. Less than a second later, being under the influence of pressure, the gas goes through special holes (this very smoke mixed with talc, you will hopefully never see during a crash you won’t experience). Since the airbags have become an important (if not to say irreplaceable) component of the modern car design, engineers are constantly studying the possibilities of testing which can be applied to air bags. German specialists, for example, have developed and systematized a number of tests that take into account climatic factors and vibration, extreme temperature changes and various conditions of the device. Manufacturers guarantee the perfect operation of airbags and are totally responsible for how air bag works in car. Insurance companies warn that automobile repair shops often cheat when replacing automotive air bags. That’s why you should know how to check airbag. An airbag can save a person’s health and life in a traffic accident, but only in case it’s installed correctly and has no damage. When you restore the car after an accident, due to which an airbag worked, you should ensure that the vehicle is not equipped with an unreliable airbag or even a used one. Very often mechanics install an airbag taken from another car, but in the invoice issued to the insurance company, they indicate the cost of a new one. As a result of such machinations, the workshop receives extra money, the insurer pays an overcharge, and the insured person is exposed to excessive risk. An airbag which was rearranged from another car is not reliable enough because it can open with insufficient speed or not open at all. In some cases, scammers go even further – they install a cover, under which the airbag is usually located, but do not install the airbag itself. They simply turn off the indicator, which should inform the driver about the absence of an airbag. Airbag fraud can turn out to be quite a profitable business. A new airbag costs 500-600 dollars, whereas the used one can be bought for less than $100. It’s rather difficult to determine the quality and availability of the airbag, since the indicator light may be damaged or turned off. Therefore, experts advise to make a replacement in workshops with a good reputation, as well as require a certificate of buying a new cushion manufacturer. Despite the fact that such receipts are easy to forge when dealing with an attentive client, scammers can be cautious and install a new pillow. In addition, insurers advise to check whether the warning light comes on when the ignition is switched on. If the indicator does not flash for a few seconds, it may be off. The issue is complicated by the fact that used airbags do not necessarily fail. At best, a properly selected and installed pillow will work as needed, but in the worst case, a tragedy can occur. So, you should check very thoroughly if your vehicle’s airbag is safe enough not to be afraid of accidents. Heartless fraudsters do not care about yours and your family’s safety: they care only about those 300 dollars they can save while swindling you. 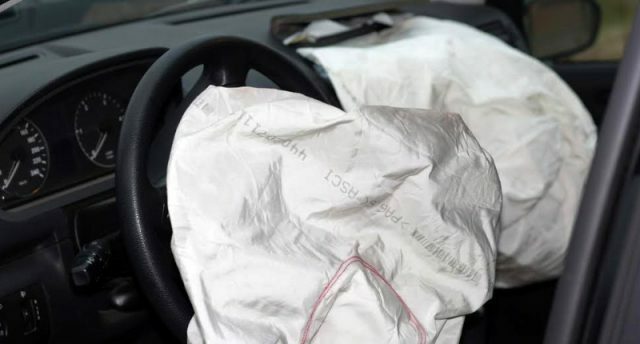 An explicitly defective airbag can be detected by visible signs of pasting it inside the car. The “Airbag” indicator should light up and go out. If it’s constantly lit up, then there is a suspicion of an error or the consequences of repair. Check the operation of the air conditioner and the soundness of the airbags: the airbag sensor does not light immediately, but after a few seconds, and if it goes off before or does not go out at all, there’s no doubt that the car was in an accident. But remember that this option is available only in the newest car models. There’s no indication of an airbag on your bill. The airbag cover has suddenly changed. It’s important for you to know how to replace airbags in a car because fraudsters often benefit from our ignorance. Consumer complaints. If a mechanic is not good at placing an airbag system in car, there will surely be complaints of him or her on the internet. Vehicle History Reports. How to check airbag if you want to be safe but don’t know how to do it technically? Go to a VIN check site and get a VIN history report. All information about the vehicle including the one about airbags will be included into a small list. Can car be fixed after airbags deploy? In very rare cases, it may be quite possible, but we don’t recommend you to drive your vehicle immediately after the airbags have been deployed. The car should be examined and repaired by a trustworthy mechanic before you drive it again. Mind your safety and check airbag as often as it’s possible, you will never regret it. Sometimes knowledge is not only power but also life.